Whether you’re purchasing an older home or new construction, I always highly recommend to home buyers I work with that they invest in a professional home inspection. Don’t let the fact that it’s new construction fool you into a false sense of peace… even new homes can have defects. Home inspection companies typically base their prices on the size of a house (square footage), so the larger the house, the more you’ll pay for a home inspection. Also, some home inspection companies offer additional services (examples include testing for mold or radon) or can direct you to other companies that offer those services. ASHI has a code of ethics and membership categories and requirements. Also, check out their frequently asked questions on home inspections and view a virtual home inspection while you’re on their site. NAHI also has a code of ethics (.pdf), standards of practice (.pdf) and different levels of membership. While on their site, check out their resource library and articles for home buyers and home sellers. Though some home inspectors or home inspection companies do not belong to either of these companies, home buyers may find the information on these sites helpful. If you’ve received a referral of a home inspector or company that is not listed in either of these sites it does not necessarily mean that they are not professional or qualified. Membership to either of the associations listed above is voluntary. The Florida Association of Realtors (F.A.R.) has released the sales reports for April 2007. Compared to last month, the number of single-family resale homes in all three South Florida counties has decreased. At the same time, the median sales price for single-family resale homes has decreased slightly in the Fort Lauderdale metropolitan area while it remained about the same in Palm Beach and Miami-Dade counties. Sales of resale condos in Broward and Miami-Dade counties has picked up while remaining about the same as last month in the West Palm Beach metropolitan area. Meanwhile, the median sale price of resale condos in Broward and Palm Beach Counties has increased slightly while the Miami metropolitan area’s resale condo sale prices has experienced a dip of approximately 9%. 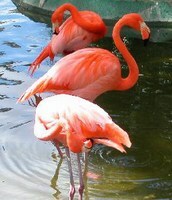 Flamingo Gardens is located in Davie, Florida – the heart of Broward County – and encompasses 60 acres. This South Florida attraction features a wildlife sanctuary and botanical gardens. Their 25,000 sq. ft. “free-flight” aviary which represents five eco-systems is unlike any other I’ve seen. Throughout the park you can see some of Florida’s native wildlife including flamingos, peacocks (roaming the park freely), birds of prey, alligators, river otters and bobcats. You can tour the historic Wray home (built in 1933) which was built on one of the highest elevations found in Broward County or meander through trails full of lush gardens that showcase rare exotic and native plants. Their narrated 25-minute tram tour is worthwhile and takes you through the tropical rainforest, native hammock, wetland areas and groves. Flamingo Gardens even has a charming wedding gazebo where many have exchanged vows. In an area just outside the ticketed entrance, Flamingo Gardens also has a nice gift shop with more than the usual tourist-y souvenirs (and includes a well-stocked bookstore), as well as a garden shop with a variety of plants and garden decor to pick from. Flamingo Gardens is also well-known locally for its fruit stand which offers freshly squeezed juices and fruit smoothies, and they’ve been shipping Florida citrus and gift fruit since 1928. Whether you are just visiting, new to Broward County or South Florida, or a long-time resident, I highly recommend a visit to Flamingo Gardens… a glimpse into “Old Florida”. The Florida Association of Realtors (F.A.R.) has released the sales reports for the 1st quarter 2007. Below are the numbers for the three major metropolitan areas of South Florida. As you can see, the number of sales are down from the same time last year. In the greater Fort Lauderdale area, single-family home prices seem to be holding steady while the prices of condos have decreased by about 6%. I believe the disparity is due to the numerous South Florida condo conversions, many of which had units that were purchased for the sole purpose of flipping to make a quick profit and by the time the closing on them took place some of those investors found themselves needing to sell the property at a break-even point, if not at a loss when the market shifted from a strong seller’s market to a buyer’s market. I believe this to be true in large part because I’ve noticed that many of the condos that are currently for rent are located in condo conversion communities, especially in certain cities where there were many apartment complexes that converted to condos. In the greater Miami area, it seems that despite all the negative news reports about foreclosures increasing and the market softening, both single-family home values and condo values have actually increased 2% and 8%, respectively. Not bad considering all the “gloom and doom” articles I’ve read over the past year. Meanwhile, in the greater West Palm Beach area (which includes Boca Raton), the median price of both single-family homes and condos have decreased by 4% since the same time last year. I believe one of the reasons for this is because Palm Beach County had the most new construction happening during the hot seller’s market. New construction generally sells for more than a similar property that’s a resale and when the market shifted, new home construction slowed.